We are offering an online personal archiving system, accessible anytime and anywhere. The smartphone is used as a front-end, for acquiring data and for quick viewing. The web environment provides extended capabilities for processing and manipulating the stored data. To be used in the kitchen to look for a recipe from last year’s paper using tags “Chocolate” and “Cake”, at work to look for a snapshot of a drawing made on a napkin at a restaurant using tags “Draft” or “block diagram”, on travel to look for tag “Insurance”. To use at class to take a snapshot of the board, adding an audio note “lecture of Prof. Johns, important stuff towards the end”. Fast, Efficient, User friendly. Our main competitor app is Evernote. In general, I would say that Evernote deals with a very wide spectrum of media storage (images, audio, video, office documents, web sites and more) while Seembee offers much more enhanced and in-depth capabilities for handling one specific type of data – namely images, with emphasis on providing tools for archiving miscellaneous personal daily documents (such as receipts, recipes, bills, instruction sheets, etc.). Unique features of Seembee, aimed at addressing such needs, are the multi-page documents support (generating a multi-page document at the acquisition phase on the iPhone, or stapling/unstapling documents from the web environment), the extensive folders and subfolders support and more. An example of use of same technology for different goals is handling audio recording. With Evernote, audio is regarded as part of the data items saved in the database. 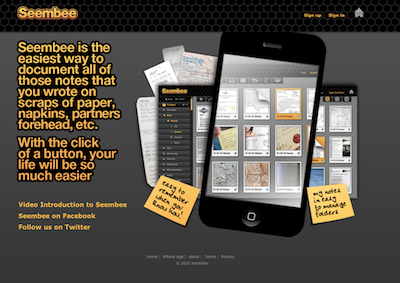 With Seembee, audio note is used to streamline the process of acquiring new documents fast. If in a hurry – take a quick snapshot, add a short audio description of the document or relevant data, and upload to the online archive. Later on, working via the web environment, one can use the data available and add notes and tags, staple with other documents, move into folder, etc.